Above: the difficulties of handling artillery in the mountains! Despite the modern custom of neutrality, the Swiss did have a military tradition. Around the year 1500, Swiss mercenaries were the most sought after and feared troops in Europe. 1815 was the last time Switzerland had invaded another state, namely France, two weeks after the Battle of Waterloo! The Swiss army had last fought in 1847, during the Sonderbund, a short civil war. Since then, Swiss troops had only twice been mobilised against possible invasion, when threatened by Prussia in 1856-57, and during the 1870-71 Franco-Prussian War. Staff officers from a Swiss army unit. At the start of the First World War, from a population of about 3.5 million the Swiss had some 220,000 front-line troops available, in addition to well over 200,000 reserves: a grand total of some 450,000 men. The main army comprised eight divisions, defending a country that was 180 by 300 kilometres (110 by 190 miles). The only full-time Swiss soldiers were 240 officer instructors and 100 men who worked on the repair of fortifications. Landwehr (reserves) troops in the mountains. The remainder of Swiss soldiers were conscripts, serving between the ages of 20 and 48. Their initial training lasted nearly 50 days, and subsequently most troops did 12-18 days of refresher training every other year. 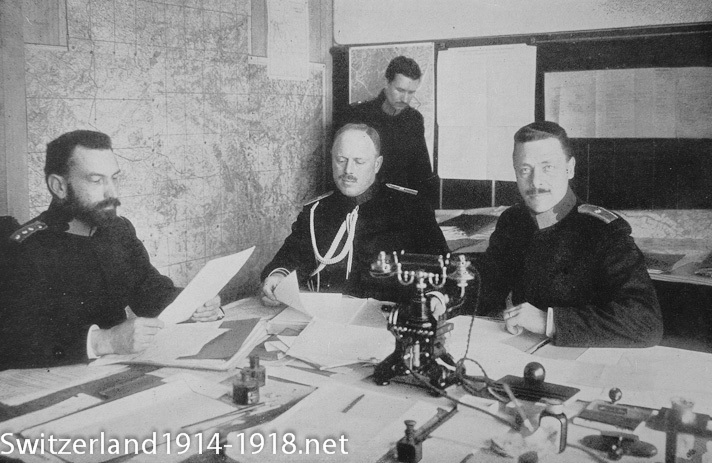 After twelve years in the Active Army, men served a further twelve years in the Landwehr (reserves). In addition, all men aged between 17 and 50 were eligible for service in the Landsturm (militia). 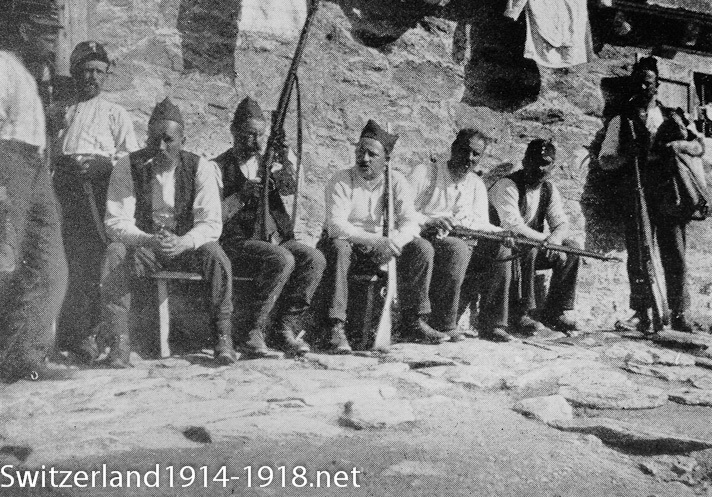 To speed up mobilisation, every man kept his rifle at home, which is still done today. Officers first had to serve in the ranks. Click here to go to the next page on Swiss army weapons and equipment.